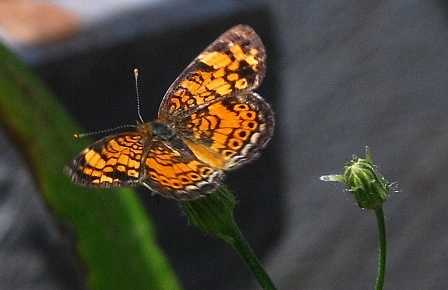 Interest in butterfly gardening is at an all time high throughout the Peach State. At one time, his activity was one-dimensional. If a homeowner wanted to attract butterflies to their yard, they planted flowers that produced an abundance of nectar. However, in recent years butterfly gardening has taken on a new dimension. Nowadays people that are serious butterfly gardeners also incorporate butterfly larval host plants into their landscape designs. However, many homeowners do not realize that some of the trees growing in their yards are also butterfly host plants. Here is a list of ten such trees and the butterflies that use them as hosts. 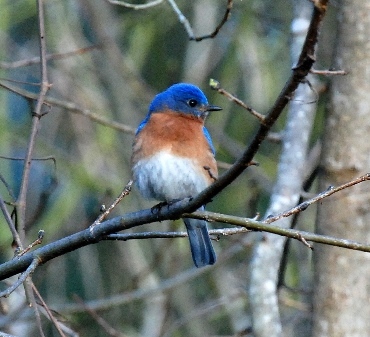 Over the years, I have encountered eastern bluebirds nesting in a variety of locations, however, recently I was shown a bluebird nesting site like no other. Beyond a shadow of a doubt, it is the most colorful and unique nesting location I have ever come across. This nesting box is situated in a forest of trees. This is not a forest of pines or hardwoods; this forest is composed of a kaleidoscope of more than 140 bottle trees. Dr. Jerry Payne, the creator of this fanciful forest, has dedicated one of his beautiful creations to the eastern bluebird. Bluebirds must have found this special tree as pleasing to their eyes as we do. During each of the three years the box has hung on a bottle tree nestled between an array of colorful bottles, bluebirds have successfully fledged young. If you have encountered an unusual bluebird nesting site, I would like to hear about it. Crepe myrtle is one of Georgia’s most recognizable summer bloomers. It is difficult to go anywhere without seeing them. We spot them growing along city streets, in yards, and around public buildings. These large shrubs-small trees are truly stunning. Throughout the summer they produce an abundance of attractive flowers ranging in color from white to purple and pink. In the fall, the foliage of different varieties turn purple, yellow, orange or red. Why even their bark is attractive. If that isn’t enough other than pruning them back in the winter, they require little care. These hardy plants are able to withstand dry conditions, bloom well in the heat and humidity of summer. On top of that, they prosper in most well-drained soil types. With so much going for it, one could easily assume it is the perfect plant to include in your home landscape. However, if you want to establish plants that are valuable to backyard wildlife, this is not the plant for you. Aside from the fact that birds occasionally nest in crepe myrtles, they have little value to wildlife. Crepe myrtles are not the host plants for our butterflies and moths. They do not produce a bounty of pollen and nectar for our native pollinators, or serve as a valuable source of seeds for birds and other wildlife species. 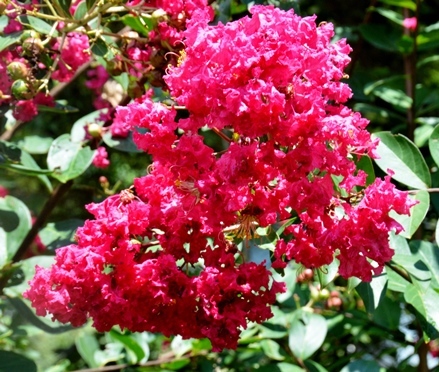 With that in mind, if you are looking for a woody plant that will only beautify your yard, plant crepe myrtle. However, if you are seeking a plant that provides beauty and is valuable to our backyard wildlife neighbors there are many other plants that fit the bill. You do not need a large area to plant native plants that attract butterflies and other insect pollinators. In fact, you can grow beautiful pollen and nectar-bearing plants in something as small as a container garden. Here is a list of 10 native plants that can be planted in containers. These flowering plants can enhance the beauty of your yard while providing butterflies with a source of nectar, as well as pollen and nectar for honey and native bees. Wild Bergamot (Beebalm) – Monarda fistula – This summer-blooming perennials grow 2-4′ tall. Spotted Beebalm – Monarda punctata – This perennial grows 2-3′ tall and blooms during the middle of the summer. Blazing Star (Dense Blazing Star) – Liatris spicata – This perennial grows up to 3′ tall and blooms in summer. Native Phlox (Garden Phlox) – Phlox paniculata – This plant blooms from summer – fall. This perennial reaches a height of 2-3′. Stokes Aster (Cornflower) – Stokesia laevis – This perennial grows from 8-12″ tall and blooms in the summer. Eastern Silver Aster – Symphyotrichum concolor – This late summer blooming perennial reaches a height ranging from 2-3′ tall. Black-eyed Susan – Rudeckia hirta – This flowering plant is a biannual. It will grow 1-3′ feet tall and bloom in the summer. Coneflower (Echinacea sp.) There are a number of native coneflowers to choose from. Most of these perennials grow 3-4′ tall and bloom during the summer. Blue Mistflower (Hardy Ageratum) – Conclinium coelestrium – This summer-blooming perennial and typically grows 18-24″ tall. Annual Blanketflower – Gallardia pulchella – This native is a summer-fall bloomer and typically grows 1-3′ tall. If you think you have done everything you need to do to attract wildlife to your yard and are still not seeing as much wildlife as you think you should, the culprit may be what and how pesticides (insecticides, fungicides and herbicides) you are spraying on you prized vegetables, lawn and ornamental plants. The environmental Protection Agency estimates that we Americans douse our lawns with some 80 million pounds of pesticides annually. This amounts to 4.5 pounds of pesticides per person per year. According to the U.S. Fish and Wildlife Service, this is a rate 10 times higher than what farmers apply to the nation’s crops. Most pesticides kill a wide variety of insects. As such, the pesticides sprayed on your roses to control pests can wipe out untold numbers of beneficial insects living nearby. By the same token, pesticides often move far beyond the place where they are applied. For example, chemicals sprayed on a windy day can drift into your neighbor’s yard and beyond. Also, runoff after a spring or summer rain can carry a lethal load of chemicals that can eventually end up in the water table, stream or lake. The thing to keep in mind is that the vast majority of wildlife that inhabit your yard depend on insects sometime during their lifetime. Take birds, for example: it has been estimated that 90 percent of all nesting birds feed on insects. Therefore, if you kill or contaminate the insects that they feed upon, you affect them too. Since frogs (all toads are also considered frogs) often feed under the cloak of darkness, these valued wildlife neighbors are often the forgotten ones. In spite of the fact that nightly they devour scores of mosquitoes, beetles, and other insects that make life uncomfortable or dine on our prizes flowers and vegetables, many homeowners leave them off their list of valuable wildlife neighbors. This is a grave injustice, as they are also great indicators of the health of our backyard environment. Since they gobble up a variety of insects, lots frogs hopping around your flower beds, is a sign that you are probably not overusing pesticides. This is especially true if a lake, stream or wetland (their breeding habitat) is nearby. The reason for this is that frogs are extremely sensitive to environmental contaminants. They can be killed when they come in contact with those deadly chemicals, by eating poisoned insects or by laying their eggs in contaminated water. If you must use a pesticide, do a little research before you select which one to apply. Your local University of Georgia Cooperative Agent is a great source of such information. Some chemicals are more deadly to aquatic life, others are especially lethal to birds, or beneficial insects. If one is highly toxic to the animals that inhabit your yard, don’t buy it. Most of us have been guilty of not following the manufacture’s recommended application rates. It is easy to believe that, if a little dose of chemical does some good, a big dose will do even better. Actually the reverse is true. The more we use further increases the chance of contaminating our yard with deadly chemicals that can endanger the health of our families and pets. Children are especially susceptible to pesticide poisoning. Always keep pesticide use to a minimum. Often garden and yard pests can be controlled by simply plucking them from plants. If you do spray, spot treat whenever possible. If you have to spray, do so on a calm day. This will prevent poisons from drifting to areas when treatment in not needed. Encourage natural predators to your yards. Ladybugs, robber flies, dragonflies, spiders, preying mantises, birds and a host of other kinds of wildlife can make a major dent in your backyard pest population. Include native plants in your landscape. Many of these plants need little or no maintenance, less water and are more resistant to insects and diseases than a lot of our favorite ornamentals. When trying to control unwanted vegetation, before you engage in chemical warfare, try chemical free methods of weed control. Some of these techniques include mulching, pulling, hoeing and digging. Pesticide safety extends well beyond the application of these products. It is also imperative that they be properly stored and disposed. Always store them in their original container far beyond the reach of children. Keep the directions with the container. By so doing, you will not have to rely on your memory when you next use them. When it comes time to dispose of a pesticide or its container, don’t simply throw them in the trash. Contact your local waste disposal agent or local recycling facility for directions. If you want to be a good citizen, enjoy a beautiful yard, and the benefits of a plentiful and diverse wildlife community, use pesticides wisely.